There is a special excitement that spreads when the first snow falls in Maine. Kids everywhere rush to grab sleds and parents everywhere start eyeing up the hot chocolate supplies. At some point, though, the charm of winter turns into a bleak outlook when it begins to feel like spring will never show up. At our house, we have come up with a few clever ways to bring a touch of spring inside to help fend off those last gray, cold weeks of winter. Using small terracotta pots, my kids and I plant grass and dot them throughout the house in the windows. Not only does this add a splash of bright green to feed our eyes, but when the grass grows we get super excited to trim the pots with scissors. A whiff of fresh cut grass on a cold February day does wonders for our spirits. 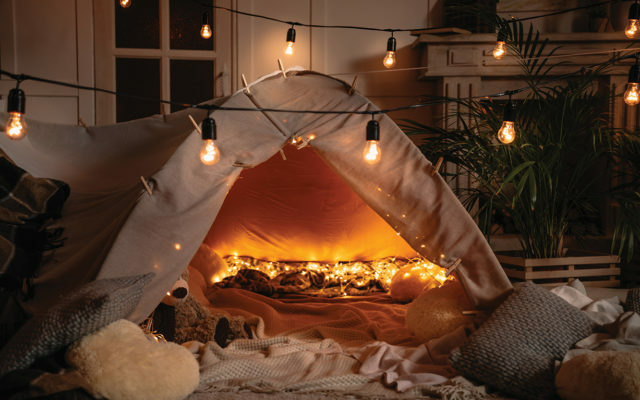 Sure, it might be too cold to go camping outside, but definitely not too cold to sleep under some pretend stars on your bedroom floor. Pop a tent inside, unroll some sleeping bags, and make some oven s’mores to get the feeling of camping really going. Sometimes we’ll even burn a citronella candle to get the smell just right as an added touch of summer. Dress up in crazy summer clothes, including swimsuits and flip flops, throw some towels and blankets on the floor, and play some fun summer tunes while you sip on fruity drinks with swizzle sticks and straws. My kids even blow up their pool toys and sit on them while eating hot dogs and popsicles. It may sound wacky but it sure makes some fun memories! Why wait for spring to start planning your summer vegetable garden? There is nothing more inspiring than pouring over seed catalogues and dreaming about fresh tomatoes, plump cantaloupes and fistfuls of raspberries. With a few supplies from the local hardware store, you can start some seeds like tomatoes, herbs, and even flowers inside and watch the first leaves unfurl before your eyes while the world waits for that snow to melt outside. Maine winters are stunningly beautiful and filled with many wonderful opportunities for making memories with friends and family. But even in the magic of Maine there comes a time when you just need a warm change of pace. With just a little bit of imagination and not much money anyone can conjure up the feeling of spring.